I thought it appropriate given the weather we had in Sydney today (max. 14 degrees and raining all day for those further afar) to share an article about some new research which proposes the existence of ‘heater bees’ in a beehive. I don’t think this has yet been accepted globally as gospel*, but it provides fodder for debate and further research. Read article below, or click on the pdf link at the bottom of the text. London: The secret of honey bees’ success has been discovered living deep inside their hives – a special type of bee that acts as a living radiator, warming the nest and controlling the colony’s complex social structure. The “heater bees” have been found to play a crucial, and previously unappreciated, role in the survival of honey bee colonies. Using new technology that allows scientists to see the temperature inside the bee hives, researchers have been able to see how heater bees use their bodies to provide a unique form of central heating within a hive. They have found that these specialized bees, whose body temperatures are higher than other bees, not only keep the hive warm but also control the social make-up within a colony. Bees, and other social insects such as ants, share jobs within a colony with each individual having a specific role that benefits the colony as a whole. It is this division of labour that has allowed bees to become so successful as they behave like a highly organised, “super organism” rather than a cluster of individuals. Heater bees are responsible for maintaining the temperature of the brood nest in a hive, whether young bees, known as pupae, are sealed into wax cells while they develop. The scientists discovered that the heater bees’ work to subtly change the temperature of each developing pupae by about one degree and this determines what kind of honeybee it will become. Those kept at 35 degrees turn into the intelligent forager bees that leave the next in search of nectar and pollen. Those kept at 34 degrees emerge as “house keeper” bees that never leave the nest, conducting chores such as feeding the larvae and cleaning. Professor Jurgen Tautz, the head of the bee group at Wurzburg University in Germany, Said: “The bees are controlling the environment they live in to make sure they can fill a need within the colony. Each bee in a colony performs a different profession: there are guard bees, nest building bees, brood caretaking bees, queen caretaking bees and forager bees. By beating the muscles that would normally power their wings, heater bees increase the temperature of their bodies up to 44 degrees – nearly 10 degrees hotter than a normal bee. They then crawl into empty cells within the brood nest, transmitting heat to the surrounding cells where the pupae are developing. In the past, beekeepers have seen these empty cells as undesirable and have attempted to breed queens that did not leave them empty, but Professor Tautz claims they are an essential part of ensuring the health of a bee colony. The heater bees, which can number from just a few to many hundreds depending on the outside temperature and size of the hive, also press themselves against individual cells to top up the temperature of each pupae. Professor Tautz said: “The old idea was that the pupae in the brood nest were producing the heat and bees moved in there to keep warm, but what we have seen is that there are adult bees who are responsible for maintaining the temperature. 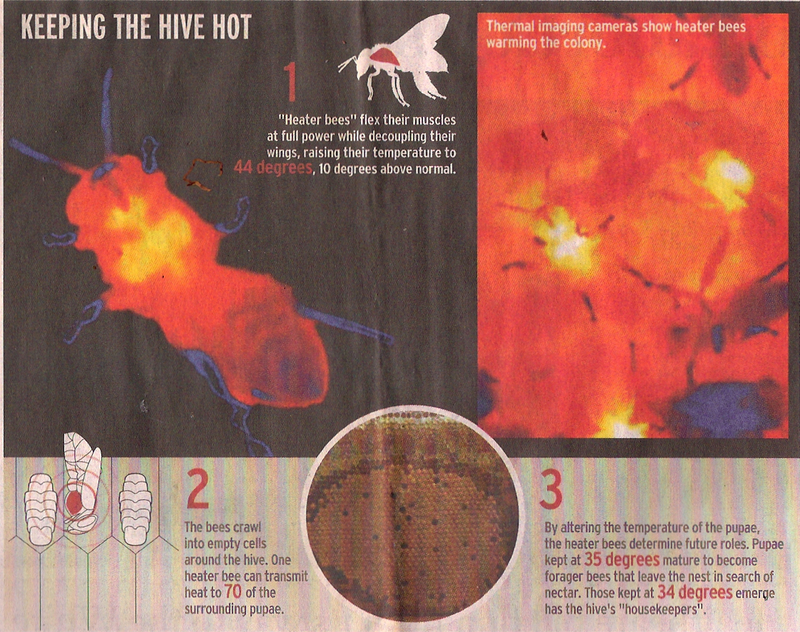 By creeping into empty cells, one heater bee can transmit heat to 70 pupae around them. It is a central heating system for the colony. * As I understand it, the existing gospel is that bees taking on a variety of roles in the hive during their lives. After they are ‘born’ they take on the role of nurse bees and then over the course of their life they take on the roles of housekeeping, cell building, scouting, foraging and guarding.